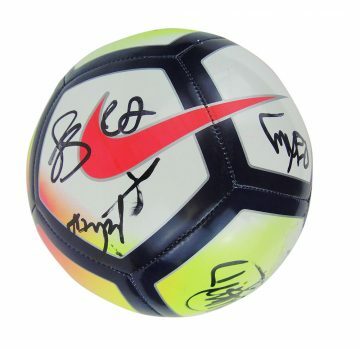 Signed Wolverhampton Wanderers football memorabilia. Signed Wolves shirts, boots, photos, football and photo displays! Many with signing proof. All with a certificate of authenticity (COA), fast worldwide shipping & free UK delivery! Wolverhampton Wanderers, affectionately dubbed ‘Wolves’ by fans and pundits, is one of England’s best loved and longest running football clubs. They have played in the Premier League collectively for over a decade. Wolves started out life as St Luke’s FC 142 years ago back in 1877, officially becoming Wolverhampton Wanderers in August 1879. They were one of the founding members of the Football League back in 1888. Wolves have long been pioneers at the forefront of the development of English football – in 1953 they were on of the first British clubs to install floodlights at their stadium Molineux – where the club is still situated to this day. The iconic badge and colours of gold and black signify Wolverhampton city council’s motto ‘out of darkness cometh light.’ It wasn’t until 1979 that the now infamous ‘wolf head’ design was introduced – but it’s now synonymous with the club and the continuous achievements and hope and renaissance they represent. 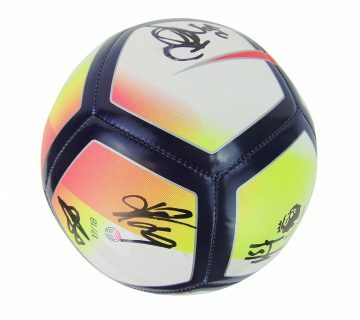 At Firma Stella we have a wonderful collection of Wolves signed memorabilia to commemorate the club’s achievements over the years, Adoring fans and collectors will find signed Wolverhampton Wanderers football shirts, boots, gloves, mounted displays and photographs autographed by a selection of the club’s brightest stars. Each item is supplied with a certificate of authenticity so you can be sure that your product is 100% genuine and unique.